UNITED NATIONS, Apr 3 2018 (IPS) - The 193-member General Assembly – one of the highest policy-making bodies at the United Nations – will get a much-needed break, come September, when a woman will preside over its 73rd session, only the fourth in the history of the world body. The two who are in the running are: Mary Elizabeth Flores Flake, Permanent Representative of Honduras, and María Fernanda Espinosa Garcés, Minister for Foreign Affairs and Human Mobility of Ecuador—both from the Latin American and Caribbean (LAC) group. On the basis of geographical rotation, the LAC Group claims the upcoming presidency—an elected high ranking UN position which has been overwhelmingly dominated by men. The break comes even as the United Nations has continued to vociferously preach gender empowerment to the outside world but failing to practice it in its own political backyard—despite scores of resolutions adopted by member states. Since 1945, the Assembly has elected only three women as presidents: Vijaya Lakshmi Pandit of India (1953), Angie Brooks of Liberia (1969) and Sheikha Haya Rashed Al-Khalifa of Bahrain (2006). And that’s three out of 72 Presidents, 69 of whom were men. The track record of the 15-member Security Council is infinitely worse because it has continued to elect men as UN Secretaries-General, rubber-stamped by the General Assembly, and most recently in October 2016 – despite several outstanding women candidates. And that’s zero out of nine male UN chiefs: Trygve Lie of Norway, Dag Hammarskjold of Sweden, U. Thant of Burma (now Myanmar), Kurt Waldheim of Austria, Javier Perez de Cuellar of Peru, Boutros Boutros-Ghali of Egypt, Kofi Annan of Ghana, Ban Ki-moon of South Korea and, currently, Antonio Guterres of Portugal. The two highest ranking political positions at the UN have long been identified as the intellectual birthright of men. And in terms of diplomatic protocol, the President of the General Assembly (PGA) has the status of a head of state in international fora. Will the election of a fourth woman as the 73rd PGA later this year augur a new era? Or is it just a flash in the pan? He said it is important to ensure that women leaders’ voices are heard on all matters in the United Nations and having a woman as the next President of the General Assembly would be a major step in this regard. “As President of the General Assembly, I have taken tangible steps to ensure that women play a key role in our work,” he noted. For example, he said, he has appointed gender-balanced teams of Ambassadors to lead almost all General Assembly processes. “Meanwhile, in my own office, I have seen to it that 70 per cent of the staff are women, and that women and men are represented equally at the managerial level. I believe that making our work at the United Nations more gender-balanced and inclusive will have a positive impact around the world,” he declared. Barbara Crossette, a former UN Bureau Chief for The New York Times (1994-2010), and who has written extensively on gender empowerment, told IPS both candidates seem to bring some interesting resumes and welcome commitments to the work of the General Assembly—“and Latin American women can be quite fearless, as you know”. She also pointed out that if one or the other is chosen, what she could accomplish would affect how the member nations (or more important, informed public opinion) would react to the idea that a woman in the presidency is a good thing and should happen more often. This is also the case with appointments to headquarters staff and high-level jobs, she noted. She said achieving gender equality, development and peace, will never be realized without women’s equal access to positions of decision-making power. The upcoming election of the President of the General Assembly is a perfect opportunity for member states to implement the commitments they have made to increasing women’s political access she added. “Member states must also promote women’s leadership within their missions and ministries of foreign affairs so that there is equality at the ambassadorial level”, said Kirkland who represents a civil society organization which, since 1992, has been using the law to protect and promote the human rights of women and girls worldwide. “We hope promoting women’s and girls’ rights around the world, particularly ending sexual violence and ending impunity for sexual assault and sexual harassment by UN staff members, will be a top priority for the next President of the General Assembly,” she declared. Meanwhile, the General Assembly last year decided to establish a new process for the selection of the President of the General Assembly. 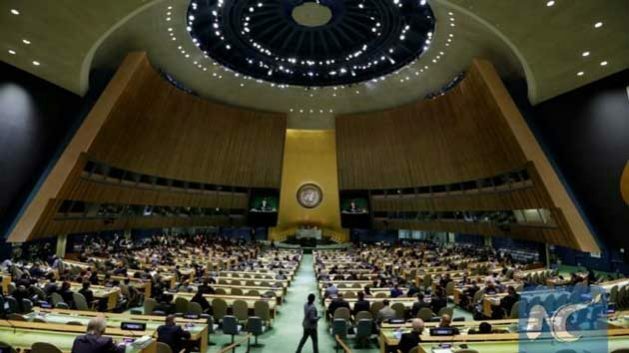 In its resolution 71/323 entitled “Revitalization of the work of the General Assembly”, the Assembly decided to conduct informal interactive dialogues with candidates for the position of President of the General Assembly, thus contributing to “the transparency and inclusivity of the process”, according to the PGA’s website. Furthermore, the General Assembly has also called upon candidates to present to the Assembly their vision statements. The new process will be in full respect of the established principle of geographical rotation and the General Assembly resolution 33/138 of 19 December 1978. Consequently, the President of the 73rd session of the General Assembly is to be elected from the Latin American and Caribbean Group. In line with the new process, the President of the 72nd session of the General Assembly will convene informal interactive dialogues with the candidates in early May 2018. In accordance with Rule 30 of the Rules of Procedure of the General Assembly, the Assembly shall elect a President and twenty-one Vice-Presidents at least three months before the opening of the session over which they are to preside.